Contrary to popular belief, we have not been hibernating… though this past week would have given a valid excuse to do so. Instead, the 2018 harvest brought nice fruit and full tanks, and we are busy tending to the cellar as the 2018 wines endure their “formative years”. We are excited to announce that we will be releasing a new wine later this year, a Gamay Noir from the 2018 harvest. 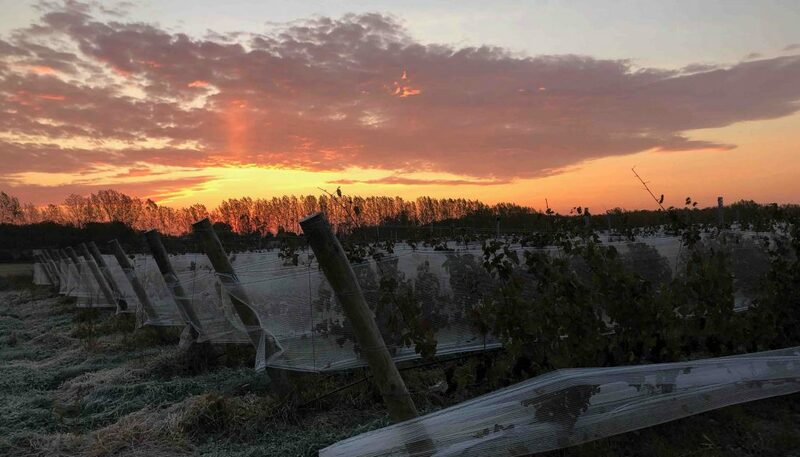 This was the last fruit off of the vines in 2018 with a harvest date of October 25th… a cool, frosty morning (photo above). Early barrel sampling leads us to believe that it will be a beautiful and varietally spot-on presentation of Gamay. If you’re not familiar, Gamay is the most widely grown variety in the Beaujolais region of France, among other cooler climate appellations. For our rendition we have used once-filled barrels to ferment and age this wine so that oak wouldn’t overpower the subtle nuances of fruit and spice. We are thrilled for you to try our first red wine sometime this coming fall. We will have Mixtape and Open Road Rosé available in 375ml cans for the beach going season this summer. We will also be planting more Sauvignon Blanc (Dune Climb) this year to keep pace with your thirsty, and discerning, palates. The tasting room is open through the winter this year. We will be tending bar Fridays through Sundays from 12 to 5 p.m. until May, when we increase our hours for the return of the snowbirds. Through the winter we are hosting guided snowshoe events in conjunction with Grand Traverse Bike Tours and neighborhood wineries Ciccone and Suttons Bay Ciders. You can book your tour here. Come see Jim and Karren in the tasting room this winter to chat about politics and the economy… or just to have some fun and drink wine. The choice is yours.